Zach Nelson (from JerryRigEverything) put the OnePlus 6 through his famous durability test, determining how strong the new OnePlus device really is. It was placed in a scratch, burn, and bend test, and while t hisdoesn't perfectly replicate real-world experience, it does offer great insight into how well your phone will hold up to normal usage. With OnePlus using Gorilla Glass 5 on both the front and back, the OnePlus 6 has proven to be in line with most late-2017 to early-2018 flagship phones in terms of the quality of glass being used. 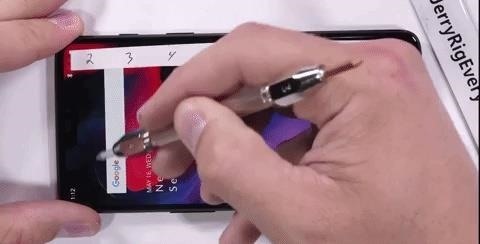 In the test, Nelson scratches the phone with different materials, each sharper than the one before it, recording when the phone receives its first mark. The OnePlus 6 received its first mark at a respectable six. This number translates to durable front and back cover which will resist the scratches of most things we keep in our pockets such as keys and coins. The notch also proves to be resistant to scratches, with the front speaker grill surviving multiple scratches from his razor blade. He was also able to confirm the use of metal on all four sides (including the buttons), which should provide adequate protection in the event your device falls on its sides. His razor blade was also unable to damage neither the rear camera nor the fingerprint scanner, which is good to know especially for those wishing to use this phone for several years. The phone was able to survive 20 seconds under his burn test. While AMOLED displays like the one found in the OnePlus 6 are far more vulnerable to heat damage than LCD panels, OnePlus 6 proves to be more than capable at surviving some direct contact with a heat source. The most popular test that Nelson conducts is the bend test. After phones like the iPhone 6 Plus failed this test (which was highlighted by MKBHD in his Bendgate video), many users trust Nelson's testing to determine whether a phone was worth the purchase. Since our phones are usually stored in our pockets, it can cause flex to the body of the phone. 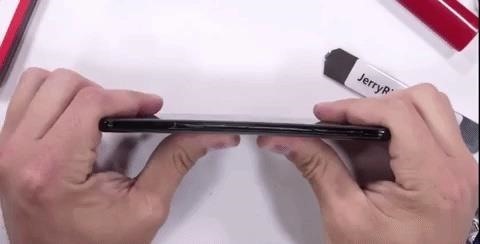 If a phone isn't reinforced correctly, over time, this bending can alter the structure of the phone. Luckily, OnePlus 6 users won't have any problems with this. Even with the change to a glass back, the phone was able to retain its structure without any cracks to the screen. While Nelson was alarmed by the initial flex, the OnePlus 6 prove to be bend resistant. Nelson speculates that the plastic lining between the glass and the metal frame is the reason for its ability to survive the bend test, which if true, proves that OnePlus took extra care when designing this device. After passing Nelson's three tests, the YouTuber recommends the OnePlus 6 as a daily driver, as it pertains to durability. The OnePlus 6 proved to be a durable device that will handle whatever is thrown at it, and remain intact no matter how long you decide to keep the device. Do note that Nelson didn't perform a drop test, which is typically the way most phones are damaged. Therefore, as with any smartphone (but especially those with a glass back), consider a case to protect your investment. 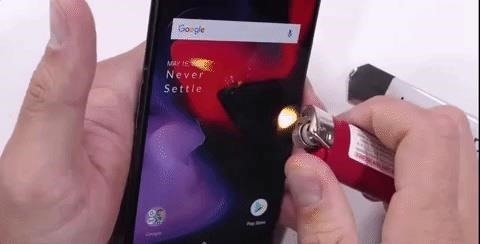 What do you think about the OnePlus 6's durability? Let us know in the comment section, and check the full video from JerryRigEverything below.